The title is slightly misleading. It, and the poster of British redcoats in a battle, suggest the show will be about depictions of war (a thorough investigation of how artists have depicted war would have been very interesting) – but it isn’t. 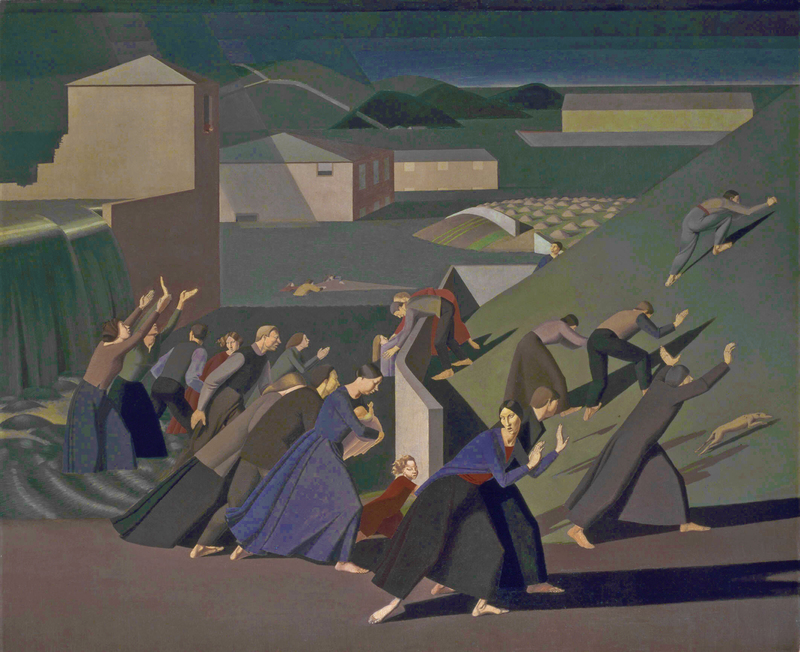 There are some depictions of war scenes and there’s an entire room dedicated to the so-called Battle of Orgreave during the 1984 Miners’ Strike, but there are as many or more depictions of non-war-related, if dramatic, scenes from history and literature, and an entire room dedicated to the Biblical flood – neither of them involving fighting or battles. Like a lot of Tate shows in recent years, this show takes a provocatively eclectic, pick’n’mix approach to the subject which, ultimately, leaves the visitor more confused than when they arrived. There are good and interesting things in the jumble, but the visitor is left, again, with the strong impression that Tate has to find themes or topics to justify displaying lots of second-rate paintings (usually kept in its enormous archive) and livened up with a handful of greatest hits to pull the punters in. Word of this must have got around: when I arrived (Friday 10.30) there was one other visitor in the whole show; when I left this had shot up to four visitors. People must have read the reviews (see below). 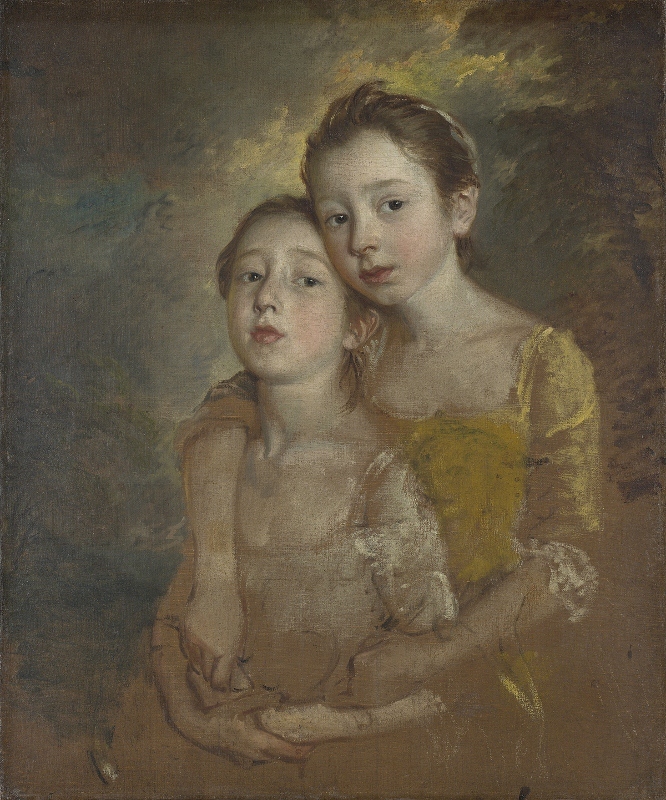 The first room points out that history painting, considered the peak of artistic achievement in the 18th and 19th centuries, fell out of favour in the Modernist 20th century and became widely associated with conservative, old-fashioned, patriotic tendencies. 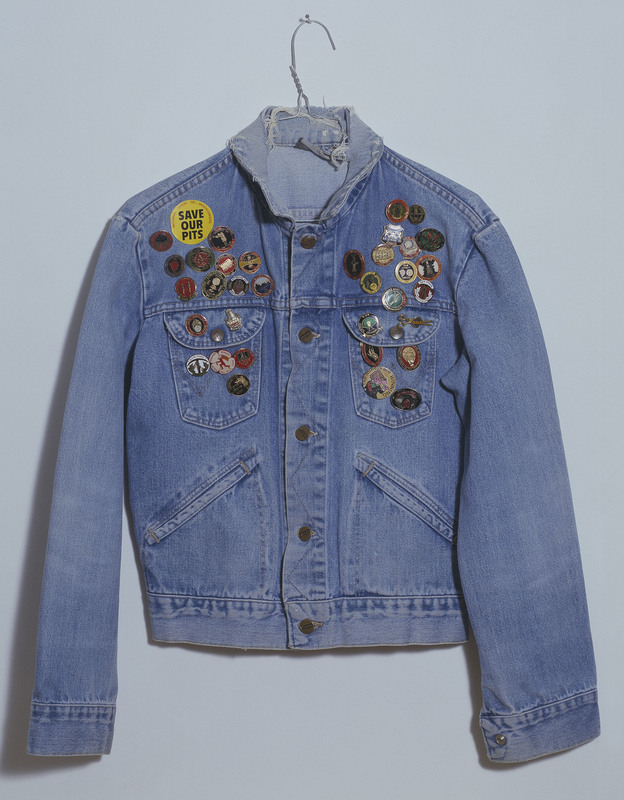 But the exhibition seeks to show that artists can still ‘engage’ with historical subjects, with ‘anti-establishment’ events, demonstrating ‘resistance’ to established authority, in ‘radical’ ways. In other words -history painting can be cool. 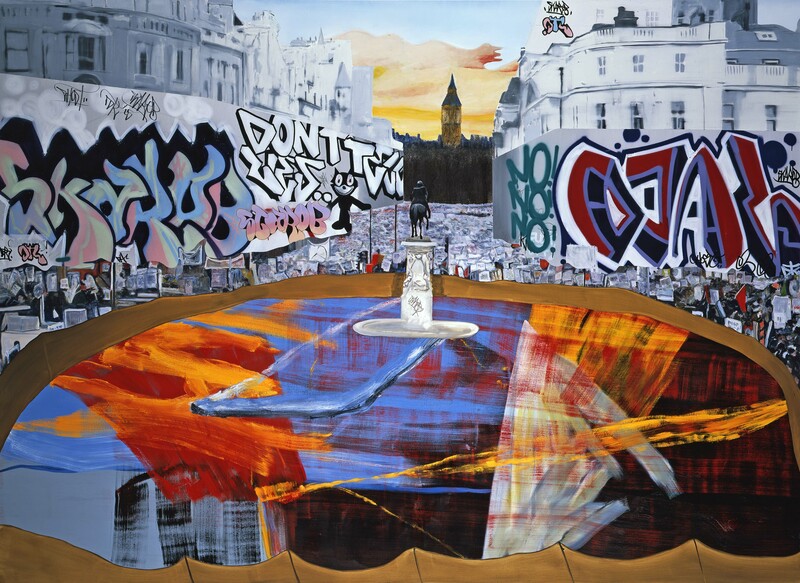 Dexter Dalwood – The Poll Tax Riots (2005) I watched this riot on TV and was caught up in a poll tax riot in Brixton around this period. I see the cleverness of imposing the Berlin Wall on either side of Trafalgar Square and this painting is very big, but I don’t find very appealing, powerful or persuasive. Jeremy Deller – The History of The World (1997-2004) Placed in the first room to maybe deliberately subvert the visitor’s expectations of a show about history painting, this instead confirms the visitor’s expectations that this will be another Tate show designed to display the curator’s eclectic vision and street-cool radicalism. Connected to the art work, Deller made recordings of a brass band playing acid house tracks, a fun idea though it seems a bit dated now. History painting in the 18th century involved taking a pregnant or meaningful moment which demonstrated heroic virtues and patriotism, figures were grouped to create a dramatic tableau (and to highlight the artist’s knowledge of anatomy) with stylised and symbolic gestures, the whole thing often referencing classical predecessors to add artistic and cultural authority. In fact remarkably few of the 12 paintings in this room reflected any of that, only the last three really fit the description. Richard Hamilton – Kent State (1970) Image of one of the four students shot dead by State troopers taken, as was Hamilton’s Pop practice, from a TV still. Walter Sickert – Miss Earhart’s Arrival (1932) I’ve never liked Sickert’s murky, muddy style. Richard Eurich – D-Day Landing (1942) Superficially realistic, this painting apparently used diagrams, maps and charts of the landing to create a slightly more schematic image. Stanley Spencer – The Centurion’s Servant (1914) Early Spencer, an example of standard English anti-Romanticism/naive style. Not that attractive. Sir John Everett Millais – The Boyhood of Raleigh (1870) A lollypop. A greatest hit. An Abba classic. Churlish not to love it. Steve McQueen – The Lynching Tree (2003) McQueen was scouting locations for his movie 12 Years A Slave and came across this still-surviving lynching tree, surrounded by graves of the black people murdered on it. Sir Lawrence Alma-Tadema – A Silent Greeting (1889) I like the ‘Olympians’, the group of late Victorian artists who painted scenes from the classical world. Alma-Tadema was often compared to the painters of the Dutch enlightenment eg Vermeer, for his attention to the detail of quiet domestic scenes. Charles Holroyd – Death of Torrigiano (1886) The commentary points out that the death of Torrigiano was taken by Protestant Brits as an example of the repressiveness of Catholicism, which prompts the thought that this is a vast subject -you could probably fill an exhibition on the theme of the fighting Protestantism of British identity since the Reformation – which goes almost untouched in this exhibition about British history. Johann Zoffany – The Death of Captain Cook (1798) Not a good painting, though demonstrating the arch and stylised gestures to be found in ‘history painting’. 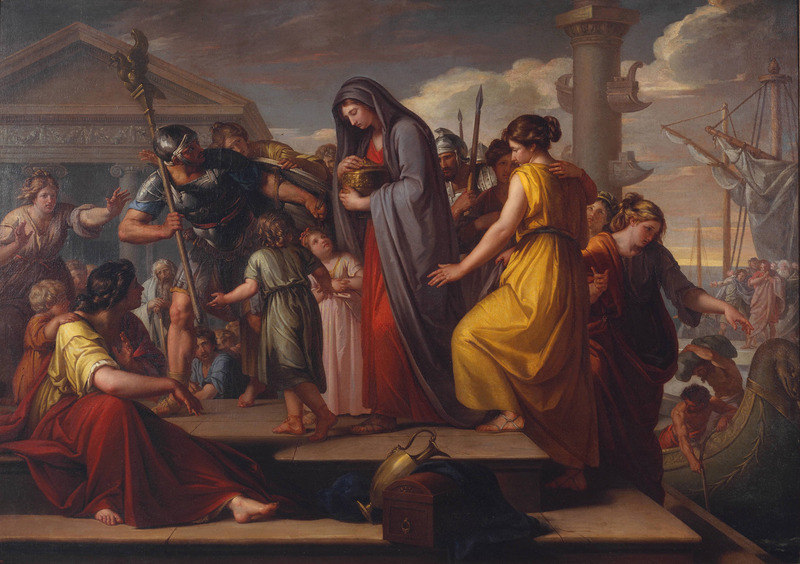 Colin Morison – Andromache Offering Sacrifice to Hector’s Shade (1760) An episode from Virgil’s Aenieid, with badly-painted classical figures arranged artfully around the canvas engaging in stereotyped expressions of emotion. Benjamin West – Cleombrotus Ordered into Banishment by Leonidas II, King of Sparta (1768) A stylised simplicity of gesture and lack of decoration which anticipates the French neo-classical painter, David. 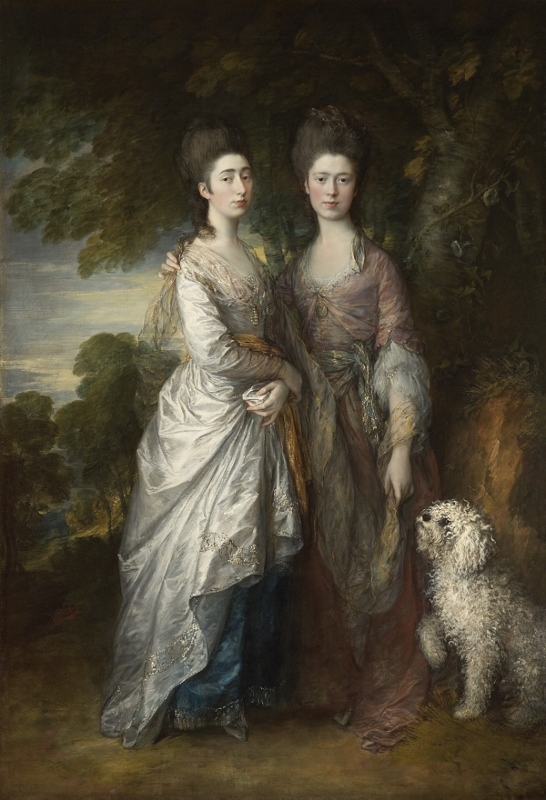 Antiquarians and painters interested in history transferred the dignity of setting and classical attitudes to myths and legends of ancient Britain, lending the aura of classical authority to our island story. Sir Edward Poynter – A Visit to Aesculapius (1880) Poynter was director of the National Gallery and an important theorist of late Victorian painting. The gestures of the women seems modelled on statues of the three graces, but are also saucy naked women which eminent Victorians could view without moral qualms. 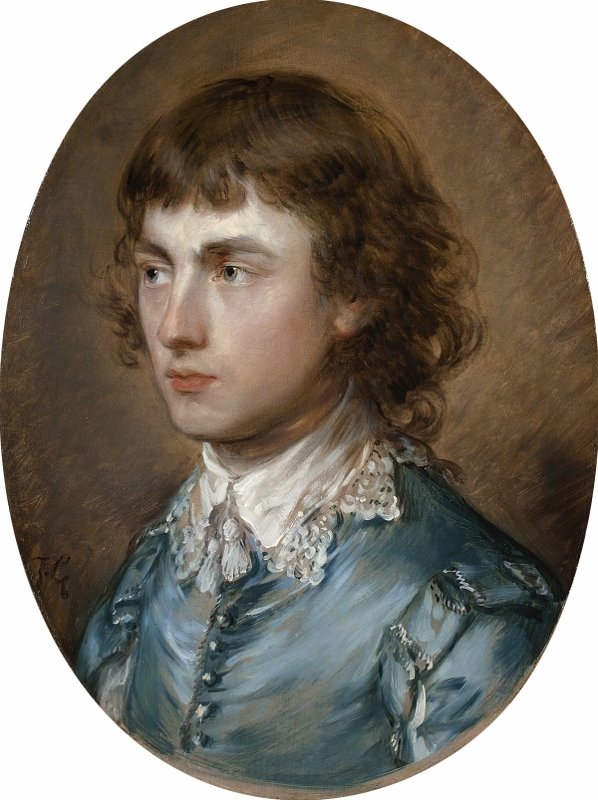 Sir John Everett Millais – Speak! Speak! 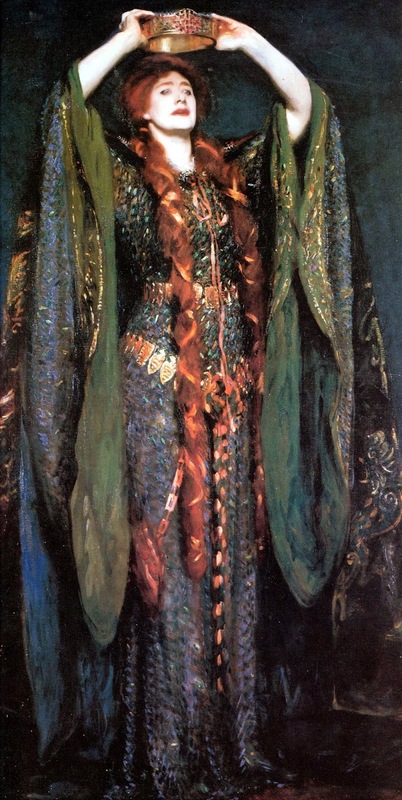 (1895) Millais was a painter of genius as various recent exhibitions of the pre-Raphaelites have highlighted. This appears to have been an entirely invented situation: the male figure reaching out is hand is corny, but the figure of the commanding woman in white is majestic and haunting when you see the actual painting, reminiscent of other late Victorian powerful women eg John Singer Sargent’s extraordinary painting of Ellen Terry playing Lady MacBeth. James Barry – King Lear Weeping over the Dead Body of Cordelia (1786-8) Once taken deadly seriously, this looks like a cartoon now. Gavin Hamilton – Agrippina Landing at Brindisium with the Ashes of Germanicus (1765) Another chaste, neo-classical canvas, the unrealistic figures displaying stylised gestures. I think the purpose is to emphasise wifely fidelity and humility, neither of which strike a chord in our times. The trouble is there is a lot of British history, an enormous amount. This selection is so random, such a miscellany, that it’s hard to extract any meaning or ideas from it. Allen Jones – The Battle of Hastings (1961) A bracing doodling semi-abstract, jokey 60s-style. William Frederick Yeames – Amy Robsart (1877) Robert Dudley, Earl of Leicester, stood a strong chance of marrying Queen Elizabeth, the only problem being he was already married. 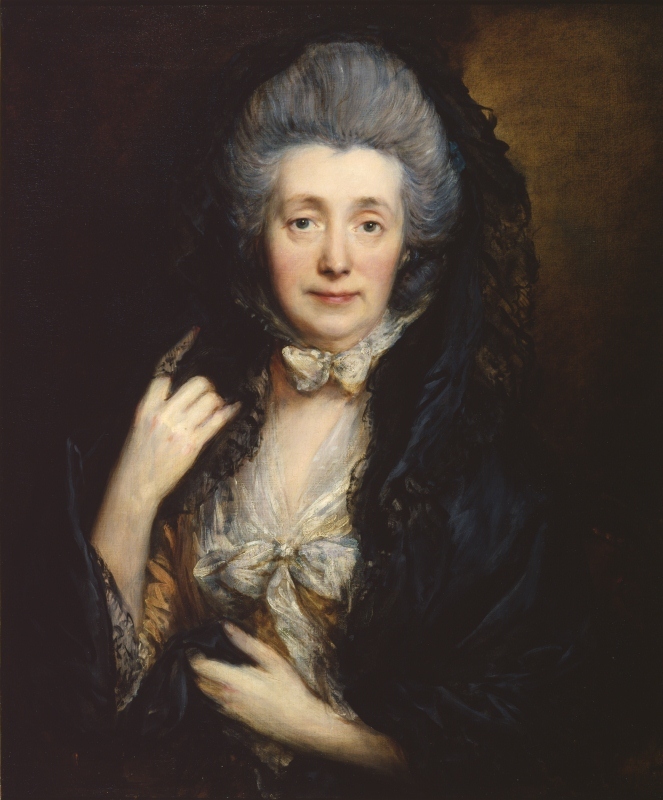 He conveyed his wife, Amy Robsart, to a country house and there his servants asphyxiated her with a pillow then threw her down the stairs as if killed by an intruder. This painting shows the killer and other servants coming across her body. I like the simplicity of the painting and the simple but effective trick of having the innocent woman illuminated by a glow with the murderous servants in gloom at the top of the stairs. Richard Hamilton – The Citizen (1981) Taken, as was Hamilton’s practice, from a still of a TV documentary about the ‘dirty protesters’ in H block. 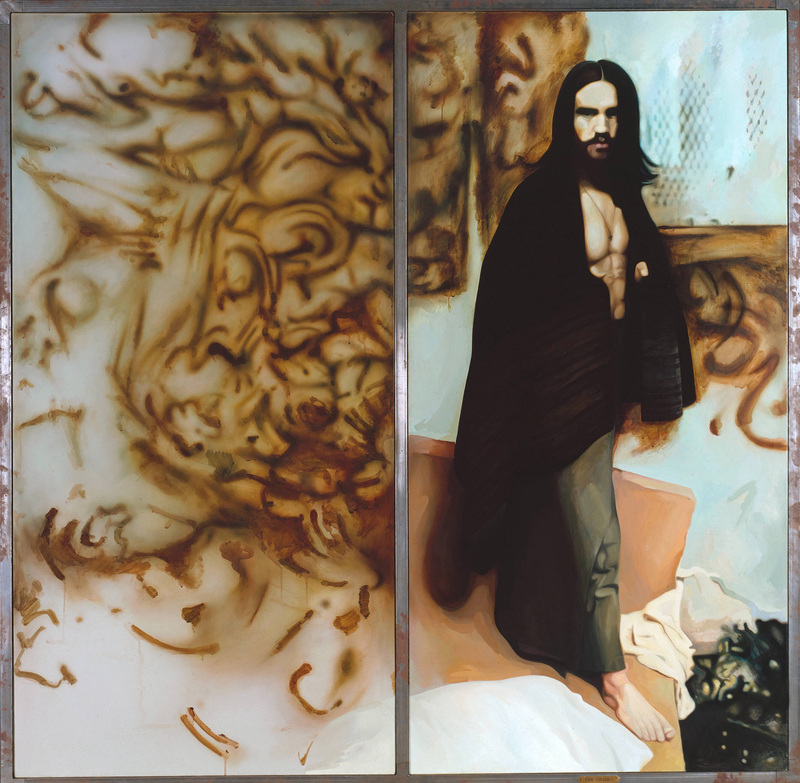 A large, striking and, I think, very successful painting due to its composition, the balance of the two panels, the abstract swirls (made out of the inmate’s faces) and the haunting Jesus-like figure of the prisoner, Hugh Rooney. 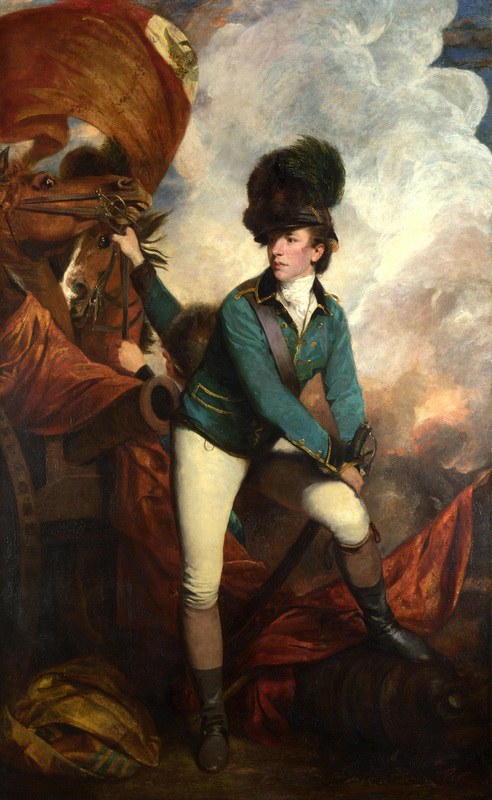 Sir Joshua Reynolds – Colonel Tarleton (1782) A wonderful composition showing what a genius Reynolds was as the posed portrait. John Singleton Copley – The Collapse of the Earl of Chatham in the House of Lords, 7 July 1778 (1779) To be admired for the sweep and flow of the composition and the use of light to highlight the heroic figure of William Pitt, Earl of Chatham, who made a great patriotic speech against granting America its independence, and promptly collapsed and died. 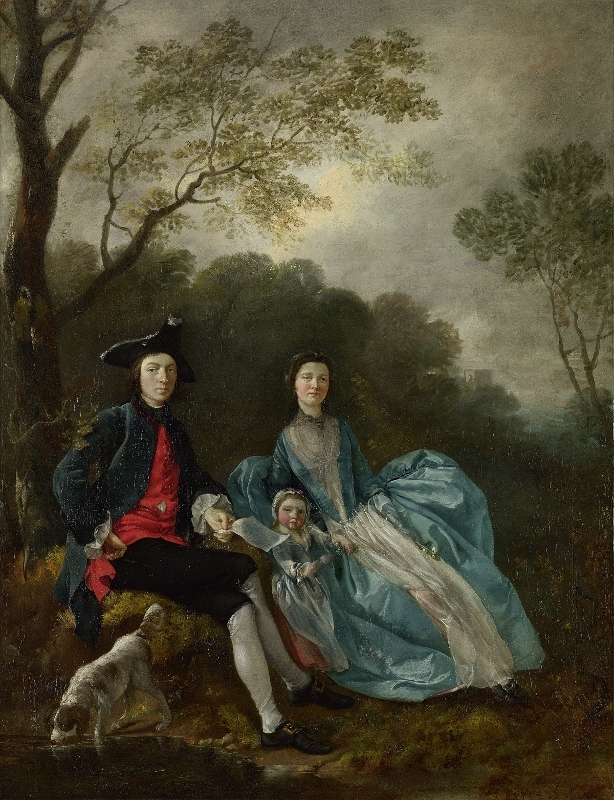 Apparently, Copley exhibited the painting privately and charged visitors a shilling a view. Philip James de Loutherbourg – The Battle of the Nile (1800) It was displayed with a key naming the ships depicted, which the guidebook to the exhibition usefully quotes. Malcolm Morley – Trafalgar Waterloo (2013) Modern construction piggybacking on two famous portraits of Nelson and Wellington. John Minton – The Death of Nelson (1952) Though obviously a modern recasting of the vent, it’s interesting to see how Minton uses the same highlight effect to focus on the hero as all his predecessors. 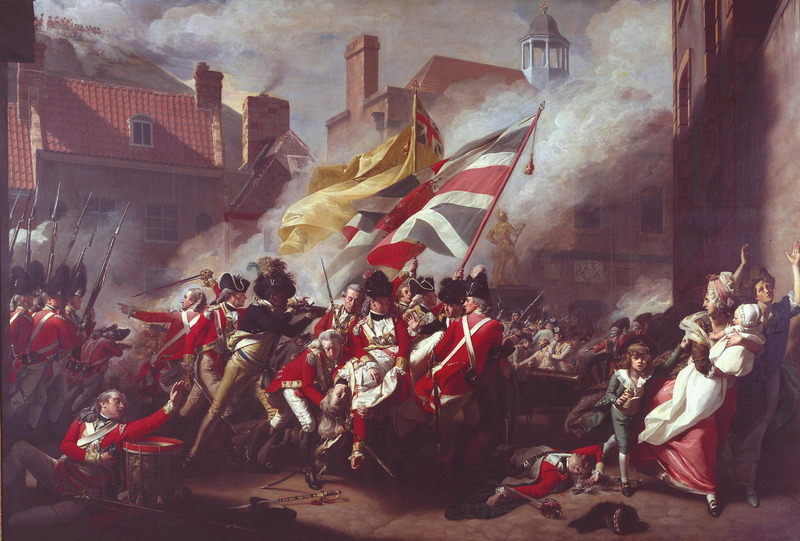 John Singleton Copley – The Death of Major Peirson, 6 January 1781 (1783) French forces tried to invade Jersey. 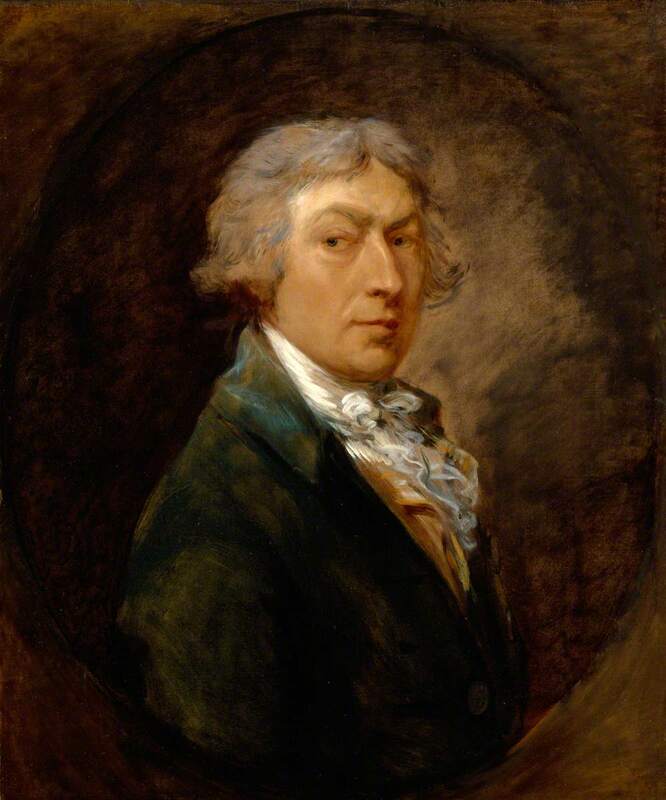 Peirson was in charge of the British defenders, refused to give way, and was shot dead by a sniper. It’s notable how contemporary many of these history paintings were, depicting events still fresh in the public memory. An entire room dedicated to the 1984 miners’ strike, focusing on the so-called ‘Battle of Orgreave’ coal mine. Part of the room is showing on a permanent loop the 62-minute documentary reconstructing the battle with eyewitness accounts and interviews, produced by artist Jeremy Deller (and directed by Mike Figgis) in 2001. The shouting and the angry Northern accents are very penetrating and spill over into the surrounding rooms, distracting me from thinking about the Battle of the Nile or Trafalgar or any of the subjects in the preceding room. I felt sorry for the poor security guards who must have to sit here and listen to the same angry Northern voices hour after hour, day after day. It must drive them mad. For me the fact that every shot in the documentary was a reconstruction fatally undermined it, no matter that many of the re-enactors had been there. It’s 31 years ago now. A friend at school’s sister was going out with a policeman who told her how much fun they were having: spirited away from boring trudging the beat, to live in barracks, with exciting opportunities for fighting on a regular basis and getting paid triple time – perfect! Next to the video is a room whose wall is covered with a comprehensive timeline of the miners’ strike, as well as display cases of journals, diaries, newspapers, a police shield, a big map of the UK with coal mines and power stations indicated, a TV showing a video of Confederate re-enactors in the US (? ), a shelf of books about Thatcher and the strike. If you want to relive those bitter days and the crushing sense of defeat many people felt at the eventual capitulation of the miners, it’s all here to wallow in. The final, very large, room is dedicated to the subject of the Deluge, the Biblical flood, nothing – you might think – to do with history or fighting. It was interesting to be told that, as a subject, it gained a new relevance in the mid-19th century with new discoveries in Geology which shed light on the deep history of the planet, with a school of scientists using the story of the Flood to explain the presence of fossils of seashells on the tops of mountains etc. All the paintings in this room were poor – big, yes, melodramatic, yes, and a bit silly. 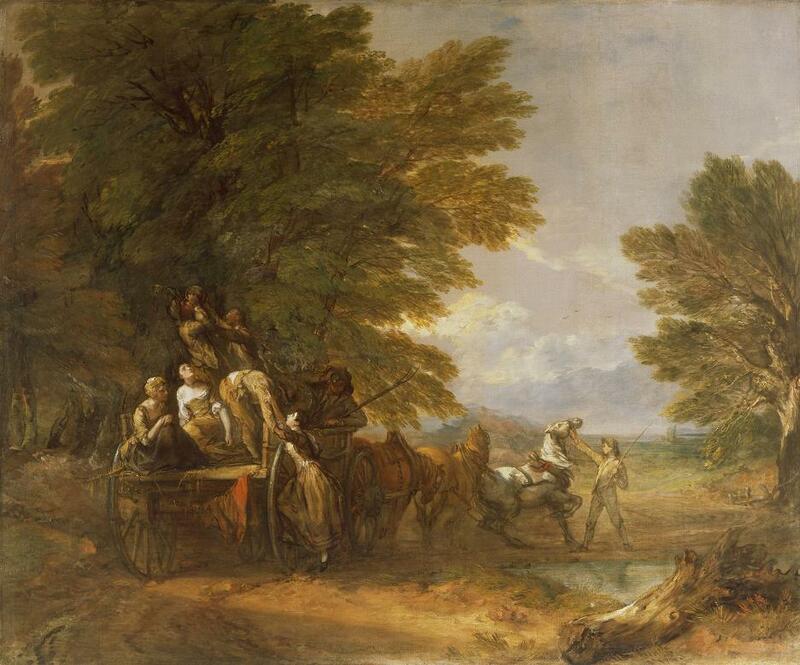 William Westall – The Commencement of The Deluge (1848) Rough thick Constable-esque crests of white paint. Looked better from the other end of the room. Francis Darby – The Deluge (1840) A powerful, smooth, heroically bad painting. JMW Turner – The Deluge (1805) A bad Turner. The commentary gives the room a bit of factitious ‘relevance’ by claiming that, with scientists warning of sea level rises due to global warming, the subject may be taking on a new relevance. Not really – warming won’t produce the flood which these paintings all depict, it will be slow if inexorable. If it happens at all. Rather than a sentence in the guide it would have been good to have an actual work making this connection. 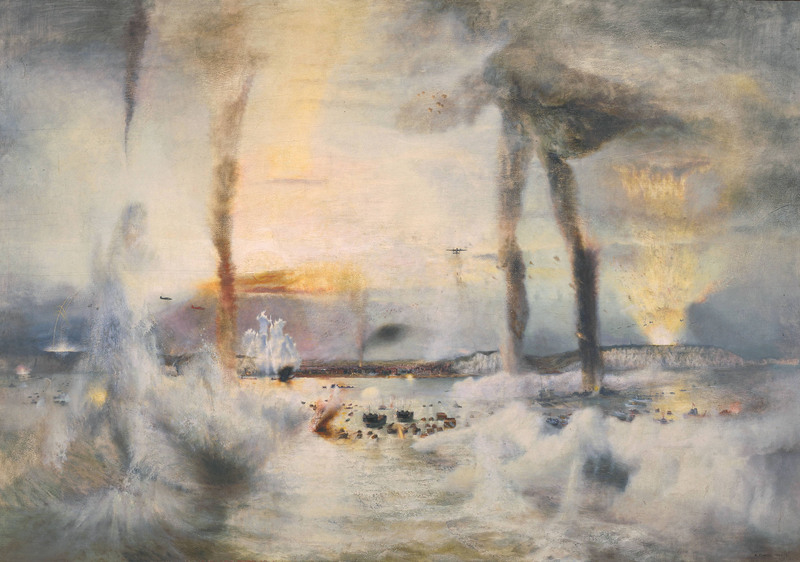 For example, one of Maggie Hambling’s sea-related works, the You are the sea installation or the Wall of water paintings which I reviewed in April.